Every year the Great Plains USBC gives out an award in honor of the late Walt Delozier, an award given to someone who exhibits many of the same qualities as Walt: integrity, selflessness, service, and a great appreciation for the sport of bowling. This year, it was a great honor for the Great Plains USBC to present the 2014 Walt Delozier Ambassador Award to local youth superstar: the 2014 USBC Chuck Hall Star of Tomorrow recipient, a 2014-15 WSU Exempt Shocker Bowler, a Wichita State University Gore Scholar--Derick Holmes. Walt Delozier was a true ambassador to the game of bowling. He served on the local Wichita Bowling Association Board of Directors for nearly 30 years! He also served on the state board for 20 years. 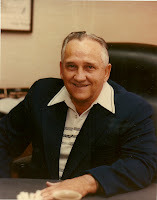 He was the Kansas Director for the ABC from 1971-1992 and served two terms as local association President. Walt is also a member of the local and state Halls of Fame. He is a life member of both organizations. Walt was a key figure for Wichita obtaining the 1989 ABC tournament, and as such, the CVB initiated the Walt DeLozier Ambassador Award. Walt was known around the country as the "Toastmaster General", as he was the toastmaster at many ABC Vice-President and President installations.